When people listen to music they enjoy, their brains drift into a resting daydream, regardless of the genre. Some prefer the twangs of the steel guitar in country, others the soaring arias of opera. Yet despite individual preferences, people’s favorite tunes generate strikingly similar brain activity patterns and can even enhance their creative ability, according to new research. We already know that emotional connections to music can be strong, but exactly how favorite melodies influence brain patterns is an ongoing area of discovery. The researchers scanned the brains of 21 young adults using an MRI machine while piping in music recordings. Each person listened to a genre they liked, one they disliked and their favorite song. By separating out the patterns that were related to the music’s beat or lyrics, the researchers found the underlying changes in brain activity related to enjoying a favorite song. A person's preferred music enhances connections between different regions of the brain, a pattern called the default mode network (DMN), the researchers report. This network is associated with introspection, self-awareness, mind-wandering and possibly imagination. When the DMN is activated, another network, the task-positive network (TPN)—which is involved in goal-oriented activity—is shut down. The two states can be thought of as focus on the outside world (the TPN) and focus on inner thoughts (the DMN). Earlier this month, another research group figured out how to switch between these two modes in mice. Certain brain disorders seem to involve trouble with activating one mode or another or with switching between the two. For example, since people with autism seem to have problems with DMN activity, the new study’s authors suggest that music therapy may help. 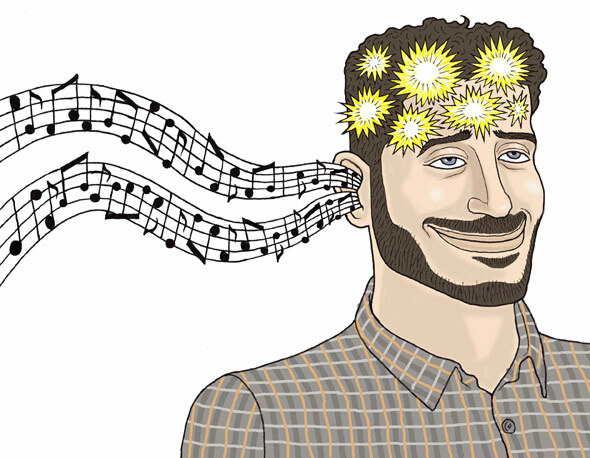 More work needs to be done to investigate the connection between music and mental states before we know if music can help people with autism, but for now, know that the frisson of happy feelings you get when you listen to your favorite song has basis in biology.